Brilliant opaque DPP Red, Pigment CI PR254, organic manufactured. Suitable for all media including plaster and cement. A: This is not genuine Vermilion, made with mercuric sulfide. It is an organic manufactured pigment and could therefore be considered a hue. We will forward an MSDS to your email address. A: You would want to use the Napthol Red, which mixes well with yellow and blue. Q: Is this pigment also known as Pyrrole Red? How water friendly is it in regard to wetting? 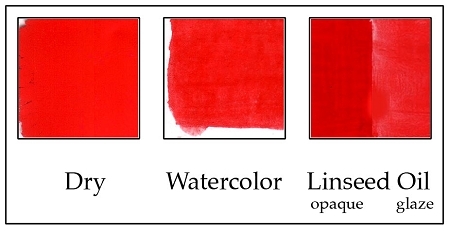 I am seeking a medium to bright red that intermixes easily with water, like the iron oxides, but brighter in chroma than that group of pigments. The pigment I seek would mix fairly easily with water, without the addition of alcohol or other chemical additives, and would be semi-opaque to opaque. Thanks. A: No, this is not Pyrole Red. It is known as a DPP color, which is the next generation of organic manufactured pigments. Higher opacity and slightly easier to wet than such a pigment as Napthol red. Q: Is this color available in gallons for exterior application on metal? A: We sell it in dry powdered form, but the pigment can easily be added to a boiled linseed oil for application onto metal on an exterior.